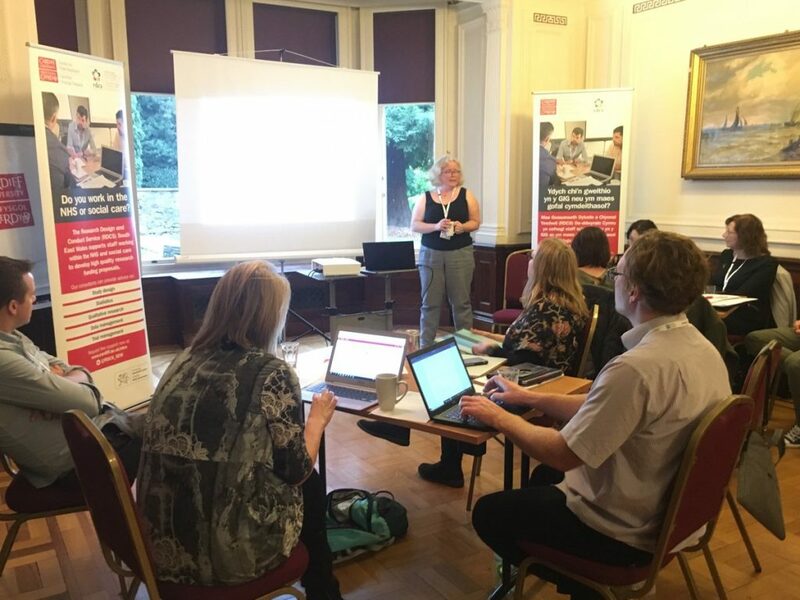 Last week the Research Design and Conduct Service (RDCS) South East Wales hosted a two-day grant writing retreat at Birchwood House, Cardiff. 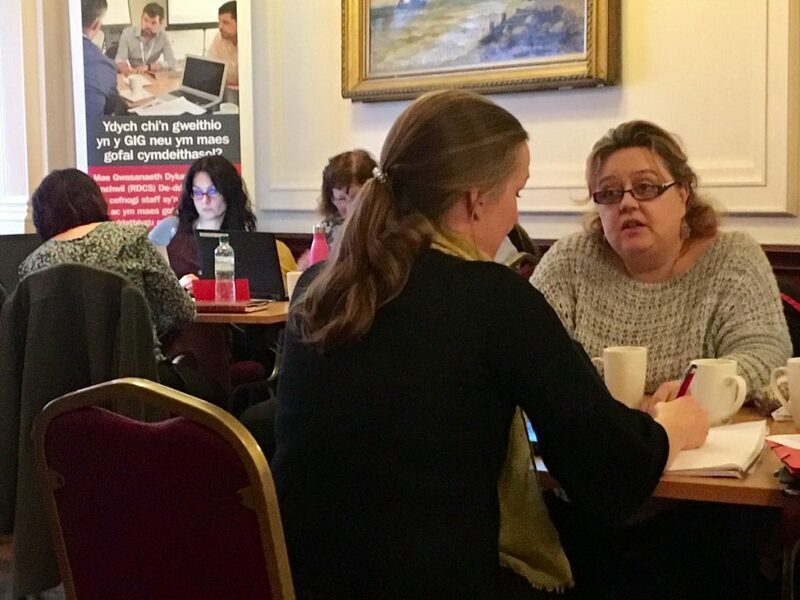 Nine NHS pharmacists, midwives, physiotherapists, GPs, psychologists, and public health researchers working across both Cardiff and Vale and Aneurin Bevan University Health Boards as well as Public Health Wales and the NHS Wales Informatics Service attended the event. They worked on eight distinct research ideas, most of them with the aim to submit their proposals to Health and Care Research Wales Health Grant or Research for Patient and Public Benefit (RfPPB), both with deadlines in early December 2018. The retreat provided delegates with two days of protected time to work on their grants either on their own or together with collaborators, and expert advice was available from consultants on a variety of topics such as study design, qualitative methods, statistical analysis, study management, and health economics. While some participants chose to hide away in the cosy atmosphere of the Birchwood Library and completely focus on their writing, others seized the opportunity to pick the consultants’ brains throughout the event. One team also invited a patient representative to join them on the second day of the retreat. Lively discussions between researchers and consultants continued well beyond the official end of the event. RDCS Consultant, Dr Kim Smallman, providing support at the RDCS Grant Writing Event 2018. To maximise the expertise available to delegates and the range of disciplines covered, the Cardiff-based team of RDCS consultants (Sue Channon, Claire Nollett, Philip Pallmann, Kim Smallman) was complemented by Pippa Anderson, Head of the Swansea Centre for Health Economics, and Centre for Trials Research Director Kerry Hood. A number of additional Centre researchers (Janine Bates, Rebecca Cannings-John, Nina Jacob, Tim Pickles, Liz Randell, Heather Strange, Khadijeh Taiyari) also attended the event to support or shadow the RDCS consultants or to work with delegates on their specific bids as well as their own fellowship applications. 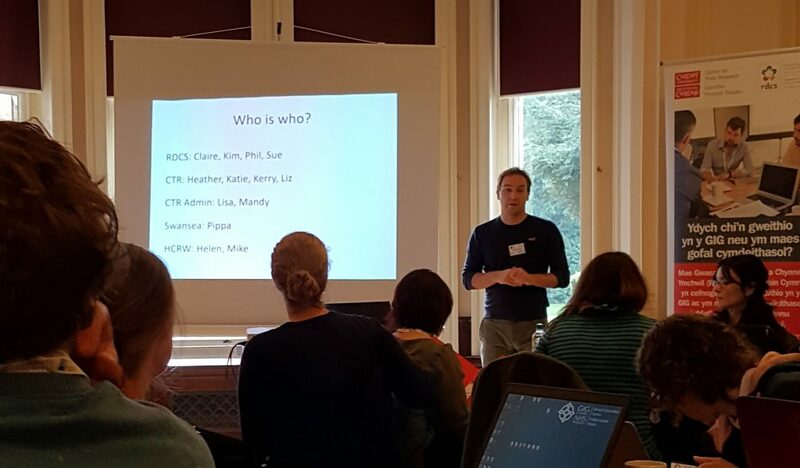 Professor Kerry Hood, Director of the Centre for Trials Research, presenting at the RDCS Grant Writing Event 2018. The consultation sessions and blocks of intense writing were topped off with a number of presentations. Sue Channon introduced what the RDCS has to offer; Kim Smallman showed how to build a competitive research team and clarified the roles of individual team members; Philip Pallmann presented feedback on RfPPB applications from previous years; Claire Nollett shared tips for Gantt charts and grant writing in general; Kerry Hood highlighted some important aspects around study flow diagrams and outlined how to cost a study; and Helen Hodgson and Mike Holloway of Health and Care Research Wales explained the attribution of costs and the difference between NHS support, treatment and research costs. On the second day of the event four participants presented their own draft flow charts to get feedback and suggestions for improvement from consultants and other attendees. Almost everyone’s research idea or draft bid changed quite significantly over the course of the two days. 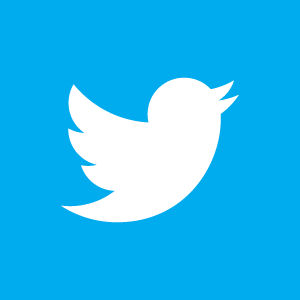 Several participants decided to revise their research questions or study design, to set themselves more (or less) ambitious targets, to apply to a different funder or funding stream, or to collaborate with the Centre for Trials Research. There were a couple of helpful suggestions about changing the timing of the event which we will take forward when we plan events next year. The RDCS South East Wales is based in the Centre for Trials Research at Cardiff University. The Centre is the largest group of academic clinical trials staff in Wales. The All Wales RDCS is funded by Welsh Government through Health and Care Research Wales.